A lot of research has been done on negotiations in face-to-face groups. With the penetration of e-mail in companies and daily life negotiations via e-mail are becoming more important. Negotiations via e-mail are different form face-to-face negotiations because they are asynchronous and computer-mediated. As a step towards a better understanding of asynchronous, computer-mediated negotiations in working groups we constructed the SAM model. The multi-agent system, SAM, incorporates many theories and findings from the social sciences. Herrmann's negotiation principle is used to structure the negotiation process. A separation into two search processes is useful for analysing the negotiation process. The opinion search is driven by commenting on reaching an idea of the 'right' solution at group level. Proposing and voting drives the majority search. Here the group seeks a suitable majority for a proposal. The best case is if both searches have the same result. The present work investigates which parameter influences which search. A lot of research has been done about negotiation and communication in small groups. Negotiation in groups has been analysed in different disciplines: two important disciplines being sociology - including social psychology - and game theory. Most empirical research in sociology focuses on face-to-face meetings (for an overview see Becker-Beck 1997). But the number of computer-mediated communication users is increasing (Döring 1999; Heil 1997). E-mail, video conferences and chat rooms are additional communication and negotiation media besides face-to-face meetings and telephone calls. In the sphere of work e-mail seems to be an important medium for negotiations (Heil 1997). Therefore I will concentrate on e-mail-based negotiation. In contrast to face-to-face communication, e-mail is asynchronous. Computer-mediated discussions, which communicate in an asynchronous way, are not yet well understood. Another important field of negotiation research is game theory. The theory is based on the assumption that individuals try to maximise their profit. The researchers are only interested in equilibriums. There are indications that people usually search for satisfying solutions and not for an optimum (Sebenius 1992). The absolute rationality of game theoretical players is criticised, too (e.g. Ostmann 1992, pp. 235). Many persons in experiments do not behave according to the theoretical assumption of game theory (Lessel 1985, pp. 46). Furthermore, game theory skips the transient phase in which the system goes from its starting point to an equilibrium, if one exists. From a sociological point of view, the interesting phenomena, like group structures, are formed in the transient phase not in equilibrium. Therefore, game theory models are less interesting. Analysing the transient phase raises questions such as how individuals choose their actions. Yet there is no consistent and empirically tested theory of how individuals choose their actions in negotiations (Becker-Beck 1997; Zander 1979, p. 424; Pelz 1995, p. 25). Existing theories concentrate on different aspects of behaviour in groups, which are usually unconnected (e.g. Nowak/Lewenstein 1996; Latané 1996). In empirical studies the group is usually put together for the experiment, therefore the group has no history or future. Additionally only a single task is negotiated (McGrath 1993, pp. 116). In the real world groups often exist over a long period and negotiate about many tasks during their lifetime. Therefore the previous negotiation influences the following one. A promising approach is to simulate negations in groups. Brunner and Tschacher (1991) developed a simulation model in order to examine the emergence of groups from a set of participants. They use a cellular automaton. The cells are either an unoccupied space or represent a certain participant. The model simulates the spatial movement of participants who try to adapt their spatial distances from their neighbours to their preferential distances. Groups emerge if a subset of the participants prefer smaller distances from each other than from other participants. The system's dynamics is determined by the predefined distance matrix. The authors want to demonstrate that the theory of complex systems can be fruitfully applied to the emergence of groups. Because the model is adapted only to developing groups, it is not a suitable starting point for an analysis of interactions within existing groups. Ostmann (1992) examines in terms of game theory the behaviour of participants who negotiate how a certain property can be distributed. In addition, the participants must form coalitions, whose composition they negotiate. Theoretically a minimum coalition exists. The individual participants have different degrees of influence. A major disadvantage is the focus on a zero-sum game. On the basis of Homan's hypothesis that the affection of two participants in a group strengthens if they interact together, and that the affection leads to increased interaction, Kirk and Coleman (1967) examine whether triads must inevitably disintegrate into dyads and an isolated individual (Simmel's (1958) hypothesis). For the analysis two variations of the model are used consisting of differential equations which describe the development of the affection and interaction frequency over time. The hypothesis could not be confirmed. A more recent application of this model has been developed by Troitzsch (1996). For an analysis of the interaction in working groups based on different personal attributes the model of Kirk and Coleman is too simple. Lessel (1985) constructed a simulation model (EMS) for the simulation of laboratory experiments. Three programs are linked together each simulating a participant in an experiment - an early form of a multi-agent system. The model describes a game-theoretical negotiation for distributing monetary values. Coalitions have to be formed as in Ostmann's (1992) model. Substantial disadvantages in EMS are that neither group structure nor the agents' arguing is modelled. Additionally the agents operate according to a simple stimulus-response pattern. With a game-theoretical, mathematical model Lindstaedt (1998) examines the influence of personal attributes, qualifications, group sizes, strategic behaviour, risk aversion and conformity on the decision quality of groups. He states that the interaction process could only be illustrated in a very simplified manner. Closer-to-reality modelling, e.g. incorporating time and other empirical phenomena, could reveal further mechanisms (Lindstaedt 1998, p. 177). With SAM the attempt is made to reach a closer-to-reality simulation, thus leaving the field of game theory. We developed the SAM model to simulate asynchronous, computer-mediated negotiations in working groups. It simulates the dynamics of the negotiation process giving consideration to personal attributes and the group structure. With this approach we go beyond traditional game-theoretical models and traditional descriptive theories of sociology. The assumption of equilibrium states is omitted. We kept the model simple to ascertain which phenomena could be reproduced and which need a more complex model than SAM. This is one way to search for a simple model with the required features. In the remaining part of the paper we use the SAM model to analyse in a systematic manner the influence of several negotiation parameters like duration, task, voting scheme, etc. After describing the SAM model in section 2, section 3 sums up the validation. Methods of investigation are described in section 4. Section 5 gives examples and a summary of the simulation results. The results are subsequently discussed (section 6). The paper closes with a conclusion in section 7. A full description of the SAM model is given in (Lepperhoff 2002). The SAM multi-agent model is implemented in the Delphi programming language. To help understand the results a rough description is given here. The negotiation structure is described in 2.2, the task in 2.4 and the agents in 2.9. An agent who says neither "I agree to" nor "I disagree with" any proposal will abstain. If an agent chooses "Wait" it does nothing during that time step. Agents are able to argue in favour of their own beliefs. The listeners may change their beliefs according to the arguments of the speaker. Talking about other topics is impossible, the difficulty of understanding and producing (natural) conversation is avoided. All actions are distributed to each agent. An experiment contains the negotiation of a number of tasks in sequential or parallel order. The tasks have the same structure. If the majority of agents are not satisfied with the solution of a previous negotiation then they start a new round of negotiations about the task. Keeping the negotiation time at a constant length allows a comparison between different tasks and between different runs. Therefore, in SAM each negotiation of a task takes the same number of time steps. After the time has elapsed the votes are counted. At every time step the agents choose their actions one after the other in a random order. Interaction in groups is affected by various factors, e.g. ideas and personal attributes (McGrath 1984, pp 12). Relations between group members constitute the group structure, which is influenced by personal attributes. Our focus is on these factors not on the task, therefore an abstract task, a colour grid, is used. Every solution is composed of a set of basic elements. As an example, imagine the group has created several new products. The participants disagree about the selling prices. Each cell represents a product. Colours represent the prices. The simulation will show how many cells were filled and with which colour. If someone is interested, for example, in the agents' success then this could easily be measured. A negotiation is divided into time steps. The agents act in a random order. During a time step an agent makes two decisions. First, it decides whether it will open another negotiation for a new cell or an already negotiated cell with an unacceptable result. Second, the agent has to act in the negotiation. We are looking in more detail at the behaviour during a negotiation To select the action with the highest utility an agent uses a four-step approach. In a first step, out of the given set of actions (making a proposal, agreeing to a proposal, disagreeing with all proposals, arguing, waiting) the agent selects all actions which are allowed and meaningful. If an agent has proposed the colour green in the previous time step already, it is neither allowed nor meaningful to propose it again. Now the agent analyses the action in the set of step one more closely. For each action Ai three values are calculated (pij for goal j). The calculation is based on the group structure (section 2.12), the agent's attributes (section 2.14) and the current situation. Under "current situation" we understand actions already taken in the negotiation process, i.e. the history of the cell's negotiation (e.g. proposals made, votes given). An agent follows three goals (section 2.18) simultaneously. The calculated utility value for an action depends on the goals, because the impact of reaching a goal varies over the actions. Thus three utility values for each action are necessary. Afterwards the action with the highest utility value is performed. Figure 1 sums up the influencing parameter of the action selection process. After the agent has carried out its action the other agents notice it. 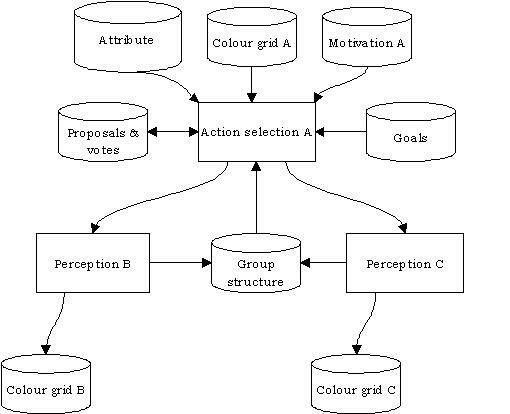 Depending on the action performed the other agents change their view of the group structure (propose, vote, argue) or their colour grid (argue). If the fixed amount of time for a negotiation has elapsed the votes are counted. Afterwards the results is communicated to the agents. The agents update their view on the group structure and their motivation. A representation of a group structure is necessary because interactions between individuals always form relationships (Frey et al. 1995, p. 353). The group structure is represented in the agents' "brain" by four dimensions: Loyalty, Leadership, Support, and Expertise. Agents are not able to establish an affective relationship with any other particular agent (a more complex language and a more complex emotional model would be required). But they can support another agent by voting for its proposal. Voting for the same proposal will increase and voting for another proposal will decrease the support relationship. Leadership focuses on making a successful proposal. After a negotiation has finished the agents increase their leadership value to the agent which has made the accepted proposal about a fixed number. The leadership value to the other agents is reduced by the same amount. Loyalty represents the formal hierarchy. Expertise refers to the ascribed knowledge. The dimensions are modified versions of the dimensions mentioned by Girgensohn-Marchand (1994, p. 71). With these dimensions different aspects of interpersonal relationships are modelled. In enterprises formal hierarchies are common (Loyalty). Individuals have different powers of influencing opinions in groups (Leadership). Some are opinion leaders and others are not (see Becker-Beck 1997). Sympathy is an important relationship in the work sphere (Frey et al. 1995, p. 353). Participants have different levels of knowledge. The integration of knowledge is a major advantage of groups in contrast to individual decisions (e.g. Heil 1997). Testing the others' knowledge is usually impossible during negotiations. Therefore, knowledge is ascribed and reflects trust based on additional factors like profession or title (Expertise). The dimension of leadership and support changes according to the agents' actions during the negotiation, the others are constant. An individual's action is influenced by his personality (e.g. Heil 1997, pp 403). But which personal attributes should be selected? Often the descriptions of negotiations only mention some striking attributes of the participants. An exhaustive psychological description is quite rare. Furthermore, the number of attributes should be kept small so that the model can be handled. Therefore, we focus on a small number of easily observable attributes. The important attributes are described here. Every attribute is measured on a five-point scalar. Therefore, over 45 different characterizations exist. The two main attributes are designed along the SYMLOG-coding scheme (Bales/Cohen, 1979), which is common for code behaviour. We focus on task-oriented behaviour. Because of the reduced communication language the agents do not behave emotionally. Therefore, the two axes "Positive (P) - Negative (N)" and "Controlled (F) - Emotional (B)" are mapped onto one axis. The set of colours which an agent accepts as a compromise solution, depends on the value of the compromise (PF-NB axis) attribute. An agent with a compromise value of zero will never accept any solution other than the one it favours. With the personal attribute influence (Dominance (U) - Submission (D) axis), we model how strongly an agent will push its idea in the group by making proposals and arguing. The above-mentioned attributes provide information on how an agent will behave. However, they do not reflect the actual motivation for playing an active part in the negotiations. An agent with a high motivation value will talk and make proposals more often than an agent with a low motivation value. The motivation value is increased at the end of a negotiation about a cell if the agent's idea is unsuccessful. Then the agent does more to improve its success, otherwise it is not changed. If the solution diverges too often from the agent's idea the motivation decreases. An agent that votes for a proposal commits itself to a special proposal. Committing oneself to a decision is a reason not to change it (Janis/Man 1977, pp 279). The attribute binding force models how strongly an agent is committed to its voting. An agent with a low value often changes its votes in a negotiation and one with a high value never does. For further attributes see Lepperhoff (2002). People follow many goals in life. Only a fixed number can be integrated in the model. Therefore, we concentrated on the work sphere, where repeated negotiations often take place within the same group (McGrath 1993, pp 117). At first glance only one goal exists in the work sphere: solving the problem. A closer view shows that individuals usually have additional goals that influence their behaviour (Sebenius 1992, pp 26). Only in very rare situations does an optimum solution exist for the given task. Usually there are many solutions with equal values and often the values are uncertain (Ortmann 1995, p. 215). Individuals vote for a proposal according to their private goals (Ortmann 1995, p. 206). The following three goals are abstract enough to cover many specific goals. A hierarchy is formed with goal weights. Each agent has its own hierarchy of goals. Improving a person's reputation (for short: reputation). The agent tries to improve the informal relationship with its colleagues. This goal is based on the empirical goal "improving one's career" (Ortmann 1995, p. 212; Kerres/Rosemann 1992, pp 6). An agent's reputation depends on two dimensions of the group structure: support and leadership (see below). Improving personal working conditions (for short: conditions). The term working conditions refers to the formal aspects, e.g. wages, position in the formal hierarchy and formal power. This goal is based on the empirical goals "expanding one's power" and "improving working conditions" (Ortmann 1995, p. 212; Kerres/Rosemann 1992, pp 6; Manz 1990, pp 88). An agent has a set of colours for each cell representing acceptable solutions that will not weaken its formal position. Solving the task under negotiation (for short: solution). Each agent prefers one colour as a solution, all the other colours are not treated as good solutions. This goal is based on the visible motivation of employees to do their job (Ortmann 1995, p. 206; Manz 1990, pp 88). The reputation of a model depends on its validity. Validation is the art of testing how well a model fits real world data. In contrast, verification means examining the correctness of the model according to its description (Gilbert/Troitzsch 1999). In the social sciences data collection is difficult because observations of people influence their behaviour. Furthermore, some data are impossible to measure, e.g. internal states (Troitzsch 1997, pp 49). A strong validation, as in the natural sciences, is therefore impossible. To provide clues to the plausible behaviour of SAM, several observed experiments will be simulated and compared with real world data. A description is given in (Lepperhoff 2000b, 2002). Additionally a field experiment was conducted. The model behaves in a plausible manner (Lepperhoff 2002). Nevertheless, the results have the status of hypotheses which should be empirically tested. SAM helps to identify promising hypotheses. the time taken (less is better) (T). a group, which quickly decides on the task but regularly changes its mind after the decision without changing its decision (called "Forget"). This work examines how the parameters affect the negotiation quality (section 5.4). A conceptual separation into two search process is useful for facilitating the analysis of the negotiation process (section 5.2). To reduce the complexity of negotiation processes, a conceptional separation of the negotiation process into two search processes is helpful. The starting point of a negotiation is a given task, about whose solution the participants have different ideas. In a discussion each speaker tries to change the ideas of his listeners to his own. Because each participant can be convinced and tries to convince the others, a search process emerges for a common idea shared by all participants. This search process is called "opinion search". The second search is driven by proposals, votes and changing opinions. Changing opinions changes votes and proposals. It is called "majority search". Both intertwined search processes together form the negotiation process. However, their influence on the negotiation quality depends on specific conditions (process parameter, task, group composition, etc.). This concept permits a more precise description of how a certain parameter influences the negotiation. For example, if the opinion search is insignificant for the negotiation quality of a specific group, then the effect of arguments is also very small. However, if the opinion search has a great influence, then the negotiation duration should leave sufficient space for discussion. For reasons of space, it is impossible to describe all the results. We present three in-depth examples: the investigation of forcing the start of a negotiation with a proposal (section 5.5), the role of the task (section 5.9) and the effect of the richness of arguments in statements (section 5.20). Section 5.28 subsequently gives a summary of all results, which are produced by the same research procedure. The HAP determines that a negotiation begins with a proposal. In the following it is examined whether this restriction is necessary. In the first series of negotiations making a proposal is required at the beginning. This obligation is skipped in the second series. Only the negotiation quality of the "Flexible" group reacts to the existence of this obligation. 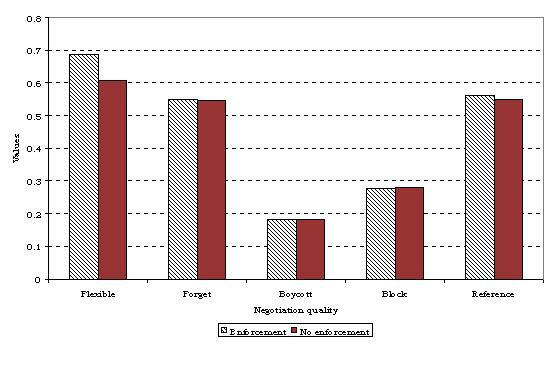 The negotiation quality of all other groups remains unchanged (Figure 2). Figure 2. Changes in negotiation quality depending on whether a negotiation has to begin with a proposal. Omitting the obligation to start with a proposal changes the negotiation process's structure of "Flexible". The agents first state their own ideas in order to convince the recipients, i.e. they transmit randomly selected bits of their world conception. Depending on the expertise structure, the past negotiations and random influences, listening agents change their corresponding bits. Changing bits means taking over some arguments. A new idea can emerge. Thus, the recipients can take over some arguments and develop different ideas. Afterwards, the common opinion is proposed and accepted by the other agents. During the remaining time steps agents are waiting (Figure 4). If starting with a proposal is obligatory the opinion search and the majority search run parallel. Communication takes place during the whole negotiation process. Sometimes several proposals also are made (Figure 3). The observed reduction in negotiation quality is based on an increasing proportion of waiting, but not on the proportion of filled cells nor the agents' satisfaction. Thus skipping the obligation to start with a proposal has no negative effect on the "Flexible" group. The SAM model assumes that an agent wants to implement its ideas and therefore makes proposals. If none of the group members make proposals, then this should be enforced. Figure 3. Agents' activities over time of the "Flexible" group. The first run with a forced start with a proposal is shown. The values indicate which proportion of agents carried out a specific action at a time step. Time steps of counting votes are omitted. Figure 4. Agents' activities over time of the "Flexible" group. The first run without a forced start with a proposal is shown. The values indicate which proportion of agents carried out a specific action at a time step. Time steps of counting votes are omitted. The idea of an agent is determined by its conception of the world. The more bits code the idea of the world, the more colours the binary string represents. If the number of colours is smaller than the colours representable by the idea of the world, different conceptions of the world result in the same colour (section 2.2). What is to be examined is whether the length of the idea influences the negotiation quality. In addition the parameter length of the idea of the world is varied: 4, 5, 6, 7, 20 bits. 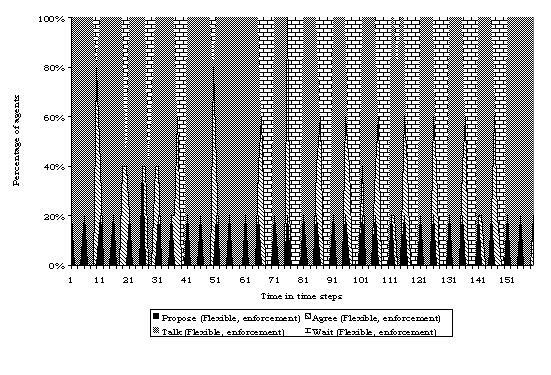 Figure 5 shows the change of the negotiation quality with different lengths of the agents' ideas. Only the scenario group "block" reacts to the changes with a slight decrease of the negotiation quality. Coincidental influences could be the cause. Altogether the length of the agents' ideas of the world does not seem to exert any influence on the negotiation quality. Figure 7. 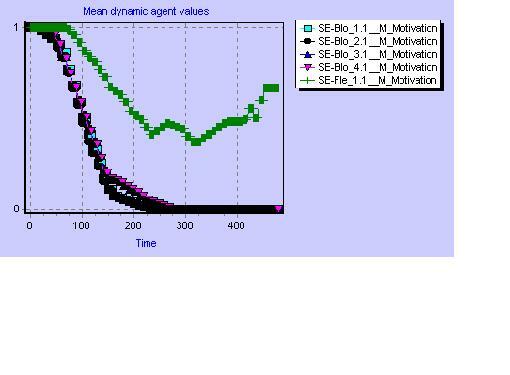 Change of the mean motivation in the "block" scenario group with 16 cells. The upper curve belongs to "SE-Fle_1.1". Figure 8. Change of the mean motivation in the "block" scenario group with four cells. The upper curve belongs to "SE-Fle_1.1". 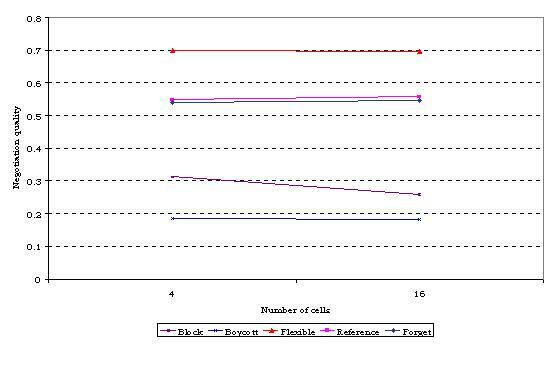 Figure 6 shows the change of the negotiation quality, if the number of cells rises from four to 16. The negotiation quality of the "block" scenario group decreases. Every time the negotiation result of a cell does not agree with the favoured result of an agent, its frustration increases. As soon as a given threshold value is exceeded, the motivation sinks. Up to then the motivation rises. The more cells have to be negotiated, the higher the frustration could become. With four cells the mean motivation sinks to zero toward the end of the simulation (Figure 8). 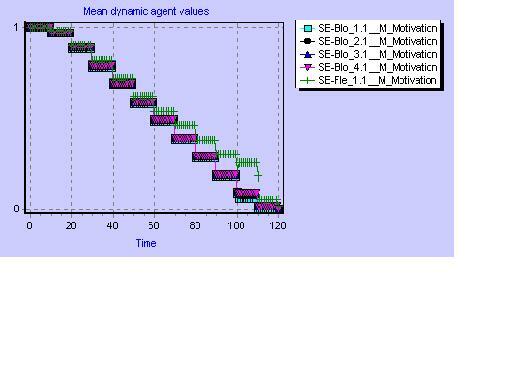 Four out of five agents have no mean motivation after half the time steps if 16 cells have to be negotiated (Figure 7). The smaller the motivation is, the fewer proposals are made and arguments given, thus the agent's power shrinks to push the result towards its own favoured colour. The ratio of filled cells is reduced from 100% to 87.5%. The size of the solution space is determined by the number of colours. The larger the solution space is, the more gradations between different ideas are possible. Decision making by the agents depends among other things on the distance between favoured colour and proposed colour. With two possible colours the smallest difference is 0.5 and with ten colours it is 0,1. During the initialization each agent randomly selects one colour per cell. If only two colours are allowed, on the average three agents have the same favoured colour. Due to the relative majority an agreement is certain. Without communication the favoured colour of three agents is the same as the negotiation result. With an increasing number of colours the probability decreases that three agents possess the same initially favoured colour. Without communication the value "participant success" therefore diminishes. The same goes for some other factors of the negotiation quality, so that the measurement of the negotiation quality depends on the number of colours. The negotiation quality decreases automatically with the increasing number of colours. 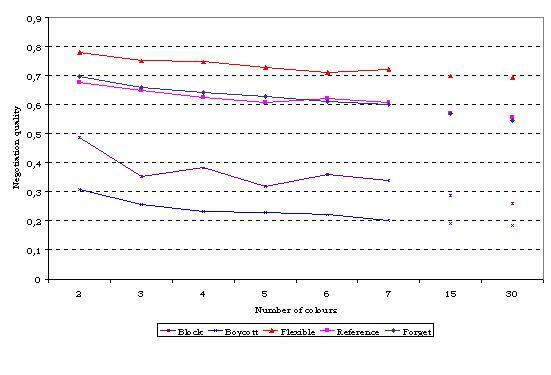 Table 1: Ratio of filled cells (standard deviation) with different numbers of colour. Longest runs are used. In contrast to the negotiation quality (Figure 9) the ratio of filled cells with increasing number of colours does not drop clearly. Table 1 shows the mean values. The Kruskal Wallis test, which examines the differences between the individual number of colours, applied to the single runs of the scenario group "block", shows no significant difference (significance value: 0.423). 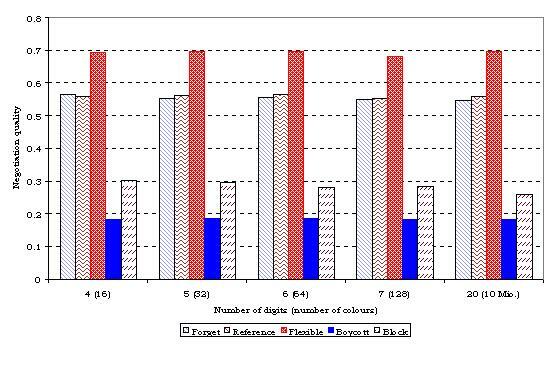 In cases with only two colours an agreement is reached because on the average three agents out of five have the same favoured colour right at the initialization. A negotiation is not necessary. If there are 30 colours and five agents, each agent usually has a different favoured colour. Only by actions like propose, argue, and agree will the majority search be successfully terminated. Therefore it is expected that the mean participation of the agents increases with the colour's number. Figure 10 confirms this consideration. The colour's number does not changes the negotiation quality - apart from pure measurement effects - probably, however, the demand for negotiation. The fewer agents have the same favoured colour at the beginning of a negotiation, the more agents' ideas must be adapted, i.e. the demand for negotiation rises. With the maximum size of the tolerance intervals tasks can be modelled permitting a limited number of solutions for each agent only. The smaller the maximum tolerance interval size is, the fewer colours, apart from its own favoured colour, is acceptable for the agent, regarding the goal of "improving personal working conditions". This is therefore only considered in the computation of one of the action utilities. In addition the tolerance interval size influences the probability that a cell is negotiated two or more times. A variation of the maximum tolerance interval size does not have an influence on the negotiation quality (Figure 11). 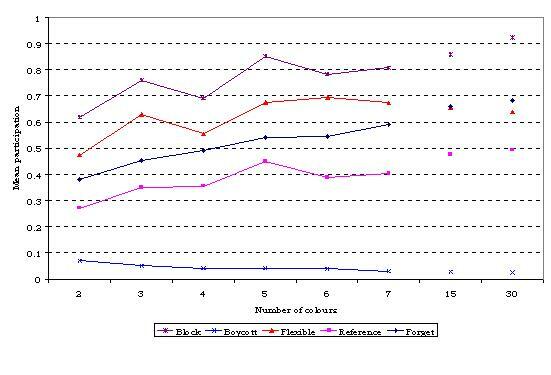 The fluctuation of the negotiation quality for the scenario group "reference" is based on random influences. In the scenario group "boycott" the first agent to act determines the negotiation result, because no other agent participates actively. According to definition, its proposed colour always lies in its tolerance interval. With the "flexible" and "block" scenario groups the voting behaviour is based on a colour favoured by the entire group ("flexible") or sub-groups ("block"), so that the serious proposals always lie within the tolerance intervals of all agents ("flexible") or the sub-group ("block"). Excluded are proposalsmade before the process of finding a common favoured colour, e.g. the starting proposal. These proposals only play a small role in both groups. In the "forget" and "reference" scenario groups the majority search is more important than the opinion search. Most agents of the "reference" scenario group have a common favoured colour at the beginning of the cell's negotiation. The favoured colours change due to the comments during the negotiation. The action alternatives "propose and agreeing" essentially steer the majority search, whereby agreeing is the more important, because only by agreement is a proposal able to reach a majority. Apparently the size of the tolerance intervals does not affect the result. As empirical experience shows, a speech contribution can contain few or many arguments. Humans can completely justify their ideas in a statement or supply only a small part. The more arguments in a statement, the faster the opinion search will result in a common favoured colour. Thus the negotiation duration could decrease. This section examines the extent to which these considerations apply,. This observation is simplified by the parameter "argument richness" in the SAM model. This parameter specifies how many bits of the agent's idea of the world will be contributed in communications to listeners. 0% corresponds to the complete statement of the agent's idea of the world in one statement. With 100% the agent says nothing. To examine the effect of this parameter, the argument richness is changed form 0% to 100% in steps of 20. Three scenario groups "flexible", "reference" and "block" react to the parameter change (Figure 12). In the scenario group "boycott" no communication takes place by definition, thus the parameter has no effect. A characteristic of the scenario group "forget" is that the agents agree on a proposal before they begin discussions (see Section 4). Thus, the parameter "argument richness" does not influence the negotiation quality in these scenario groups. Figure 12. 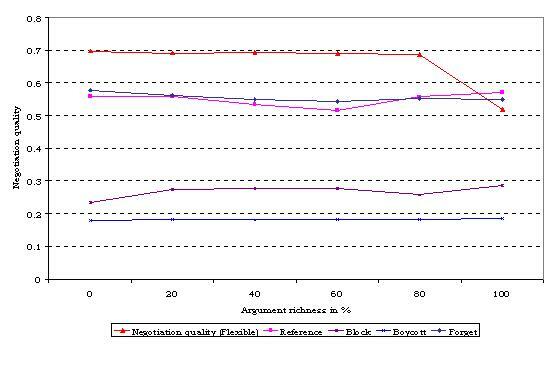 Change of the negotiation quality for different values of the parameter "argument richness". Table 2: Overview of the mean negotiation quality and the standard deviation for the scenario group "reference" with changes of the argument richness. The figures are from the last time steps with at least two runs. 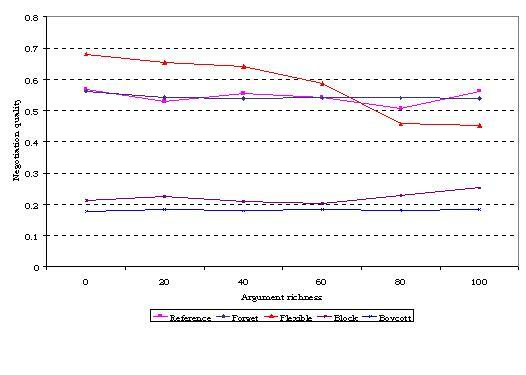 The negotiation quality of the scenario group "reference" seems to change as a function of the argument richness. Negotiations in this group vary in total length. To examine the parameter's influence in more detail we use the figures from the time steps with at least two runs available (Table 2). The fluctuations of the negotiation quality seem to be caused by random effects regarding the standard deviation. Figure 13. In-depth analyse of scenario group "flexible". Figure 14. Change of negotiation quality in all five scenario groups with different argument richness and a negotiation duration of four time steps. The scenario group "flexible" looks for compromises as it first tries to develop a common favoured colour by discussion. With an argument richness of 0% a common favoured colour is nearly completely developed within one time unit. For larger values the negotiation duration still seems to be sufficiently long for the development of a common favoured colour. Only if no arguments (bit) are exchanged, can no common favoured colour can developed more. The agents increase their participation in order to adjust the small content of their speech contributions. With an argument richness of 100% this is by definition doomed to failure. Fewer cells can be filled, because a favoured colour is missing (Figure 13). Generally, it can be said that the argument richness influences the time needed to reach a common favoured colour if possible. 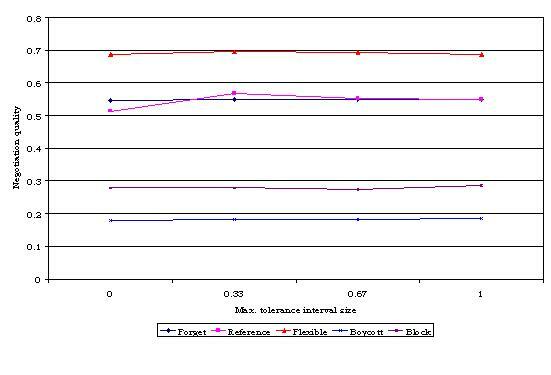 Figure 12 and Figure 14 show that the effect of the argument richness on negotiation quality depends on the negotiation duration. 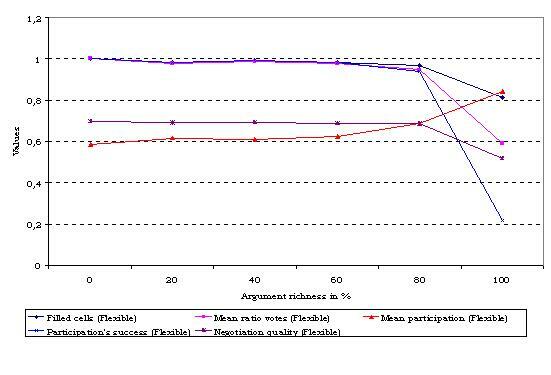 A long negotiation duration can compensate a low argument richness, as the scenario group "flexible" Figure 14 clearly shows (negotiation duration of four time steps). If the negotiation duration is ten time steps than the argument richness only affects the negotiation quality by the extreme values of 0% and 100%. The values in between influence the negotiation quality if the negotiation duration is four time steps long. The strength of the influence depends on the importance of the search for a common favoured colour for the group's negotiation process. As stated above, the opinion search is important for the scenario groups "flexible" and "block". However, here the number of agents seems to exert an important influence. It takes longer to combine the ideas of five agents ("flexible") than of two agents ("block"). The scenario group "block" does not seem to profit from high argument richness. On the contrary, maximum negotiation quality is achieved if there is minimum argument richness (100%), i.e. if no more arguments (bits) are communicated. By the exchange of arguments (bits) the agents in the two blocks adapt their respective favoured colours. Thus, two blocks develop of favoured colours with two agents each. The fifth agent can follow a block or favour its own idea. At the beginning of the simulation the two agents of each block have different favoured colours. During the negotiation process they adapt their favoured colours and try to convince the other three agents. Majorities can come about only if a block and the neutral agent have the same favoured colour or if a block does not act in a closed manner or not at all. As soon as the argument richness amounts to 100%, the blocks cannot be formed any longer, so that each agent acts independently. Thus the blockade induced by block building is dissolved. Figure 15. 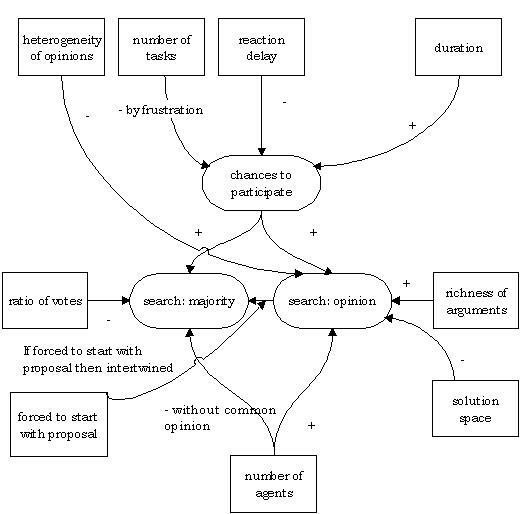 How parameters influence the search for a common opinion and the search for a majority. "+" indicates supporting and "-" weakening relations. Figure 15 shows in summary the relations between parameters and the negotiation process. More precisely, the figure describes the negotiation of a task (cell) not the selection of a task. The selection of the next task (cell) takes place on an upper level. The negotiation process is understood as a linkage of the two mentioned search processes. If actors have heterogeneous ideas or if they express only a few arguments in their statement then the opinion search is made more difficult. With a large solution space (number of colours) the ideas' distance is generally larger, so that the search takes longer. A large number of active participants accelerates the opinion search, because more contributions can be made per time unit assuming that each participant has sufficient time for reading and acting. The ratio of pro to contra votes determines how difficult the majority search is. If the participants do not have a common opinion then the majority search becomes more difficult with the increasing number of participants. If the votes are given secretly they should be linked to comments indicating the actor's opinion. Both searches are accelerated if the actors have sufficient participation possibilities, which are determined by the duration of the negotiations and the non-standard reaction delays. If more tasks (cells) have to be negotiated, the actors' motivation becomes more important. Without the obligation of starting a task with a proposal, the two searches run sequentially. A common opinion is looked up first, and afterwards a majority is sought for this obligation. With the above obligation both searches are intertwined. An important question is whether the negotiation support system has to automatically guarantee that all tasks are processed, or whether this remains the responsibility of the group. As long as at least one actor is sufficiently motivated and everyone can initiate a negotiation, all tasks are negotiated without a system intervention. Within a repeated negotiation the negotiation support system can suggest the old result, if it exists. If there are blocking subgroups in a group, automated suggestion of the old result should be skipped. Whether the negotiations of the tasks take place in parallel or sequentially seems to be of no significance for the negotiation's quality. Neither the number of maximum admissible repetitions nor the minimum distance between two repetitions affects the negotiation quality. Generally it also does not matter whether the failure of the negotiation is worthwhile for the group or not. However, groups which profit from a failure can abort the remaining tasks, if the negotiation support system is not in order to guarantee completeness. There are some differences between face-to-face group interaction, which is the traditional field of group research, and asynchronous, computer-mediated group interactions, which have hardly been examined so far. The participants no longer compete for speaking time, but for the attention of the reader especially in larger groups. The importance of the reader increases because he distributes his attention autonomously. Thus group members may read different contributions. Therefore, they have different perspectives on the group process. There are not only differences, but also things in common. Both computer-mediated, asynchronous negotiations as well as face-to-face negotiations need a voting scheme. Some empirical investigations suggest that the negotiation result does not depend on the required majority. Others state the opposite (Zander 1979, p. 425). Both findings can be explained by the simulation experiments performed. An important factor is the ideas of the actors. As long as the negotiation result is supported by a majority of the actors, nothing changes by increasing the required majority. The majority is still sufficient. The second finding can be observed if only a few actors agree. According to Schneider (1985, pp 21) there is an empirical tendency for groups with heterogeneous personal attributes to be more successful than homogeneous groups. In addition, in heterogeneous groups more conflicts arise. So far no satisfactory theory for these observations exits and empirical findings are contradictory (Schneider 1985, pp 214). The actors' personal attributes and the group structure can mutually compensate each other (Lepperhoff 2002). Unfavourable personal attributes of an agent can become balanced by other more favourable ones. It is also possible that personal attributes of different agents may mutually compensate each other. Furthermore, certain personalities can be obstructed or promoted by the group structure. For example, prophets influence only those willing to listen. Therefore, general conditions for the success or failure of the two search processes cannot be indicated. The performance of the negotiation always depends on the specific constellation of the personal attributes and the group structure. Thus Sader's (1996) observations for real groups are supported. Negotiations are only one part of the activity of real groups and, to that extent, support for empirical observations is not trivial. In addition, this finding leads to the conclusion that small modifications of the personal attributes or the group structure of a group can lead to more efficient or weaker negotiation processes. In sociological group research a frequently examined topic is the question of the conditions under which group members become leaders. A leader is a person who realizes goals with the support of the other group members. The goals are important in the leader's eyes (Schneider 1985, p. 167). In the SAM model is the only goal of the group to solve the task. Agreements in negotiations need the assistance of many group members by agreement or abstention. Making successful suggestions is a way of attaining the group's goal. Additionally the agent's leadership value increases. An agent with high leadership value, is therefore, a task-oriented leader. Figure 16. Representation of the group structure in the dimensions of leadership and support at the end of the first run of the reference scenario for the "Flexible" group. Agents start at the point (0.5, 0.5). The points shown are means of agents' leadership and support values towards the named agent. The task-oriented leader is characterized by high leadership values. 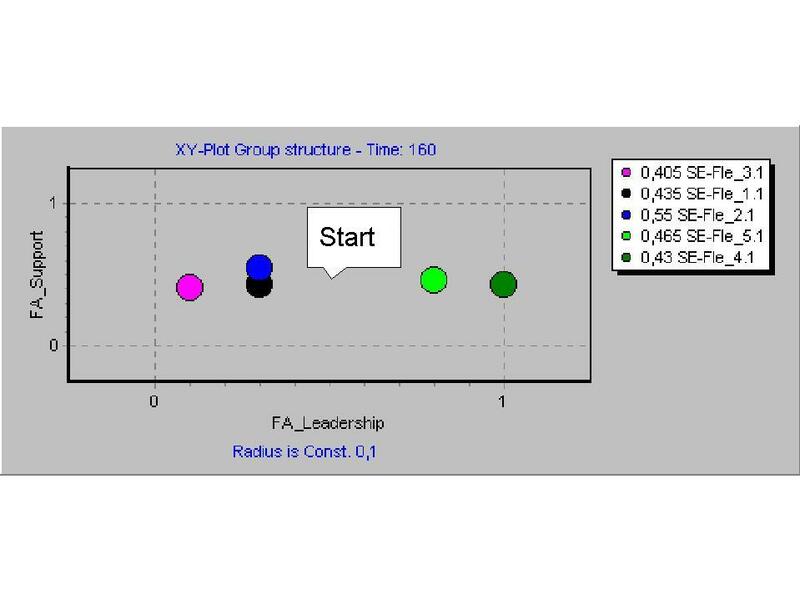 In Figure 16 the agent "Fle4" became the leader. Which agent becomes the leader is different from run to run, because the group structure does not distinguish an agent, neither positively nor negatively. Furthermore, all agents in this group have the same personal attributes, the distribution of the ideas and the action sequence determine the chances of becoming a leader. An agent, who makes the first successful proposal by chance, strengthens its leadership. Afterwards its chance of making another successful proposal slightly increases, because now the other agents are more willing to support its proposals. The value is small, but it increases the probability of being successful again. Therefore, a positive feedback loop exits. Looking at another group called "Reference", which is an example of an empirically observed group with an externally determined leader, the agent "T" already starts in the leading position and maintains this position during the negotiation (Figure 17), because its position is supported by the fixed loyalty and expertise structure. Figure 17. Representation of the group structure in the dimensions of leadership and support at the end of the first run of the reference scenario for the "Reference" group. The upper diagram shows the group structure at the beginning and the lower diagram at the end of the negotiation. The finding that groups have at least one leader leads to the question of which personal attributes facilitate leadership (Schneider 1985, pp 170; Zander 1979, pp 442). According to Schneider (1985, pp 170), no connection between leadership and personal attributes can be derived from the different studies available. Some attributes like motivation, intelligence, self-confidence, activity and social abilities are often mentioned. However, they are not always present. According to the "situation theory of leadership" leading depends on the specific situation conditions. The SAM model helps to distinguish the relevant parameters and their interaction. SAM shows clearly that the group structure favours some actors. An actor influences other actors' opinions more often, if he is recognized as an expert or an opinion leader. Influence on an actor's opinion also means an influence on his voting behaviour. Whether an actor becomes a leader depends, furthermore, on his personal attributes. A silent opinion leader does not realize his potential influence. Nevertheless the group forms a system, i.e. the leader and other actors influence each other's behaviour. In SAM this interaction is shown, so that leader changes can also be examined. The potential of SAM has not yet been exhausted by the available analyses. For example, the role of the group structure could be examined in more detail. A lot of research has been done on negotiation in face-to-face groups. With the penetration of e-mail in companies and daily life negotiations via e-mail become more important. Negotiations via e-mail are different from face-to-face negotiations, because they are asynchronous and computer-mediated. As a step forward we have constructed a model for simulating asynchronous, computer-mediated negotiation in working groups (SAM). The multi-agent system, SAM, incorporates many theories and findings of the social sciences. Herrmann's negotiation principle (Herrmann 1995; Herrmann/Stahl 1998, 1999) is used to structure the negotiation process. In this paper we analyse the influence of various negotiation parameters like duration, task, voting scheme, etc. In answering this question, it is useful to separate the negotiation process into two search processes. The opinion search is driven by commenting on reaching an idea at group level for the "right" solution. Proposing and voting drives the majority search. Here the group looks for a suitable majority for a proposal. The best case is if both searches have the same result. The first goal is reached by stating which parameter influences which search. The potential of the SAM model goes further. Furthermore, for a specific group measurements are computed by the SAM model to improve the group performance (Lepperhoff 2002) or the success of an individual (Lepperhoff 2001). Thanks are due to Klaus G. Troitzsch's team and the anonymous reviewer for their advice. The present research is funded by Forschungszentrum Jülich GmbH. 1	Single runs have to be used to look an individual agent's behaviour, because the calculation of means is less meaningful. What is the meaning of half a proposal? 2	To understand the following line of argument it is important to remember that the correspondence between the parameter values and the common interpretation of "richness" is counterintuitive! 3	The term "actor" refers to the sociological model of a human. In contrast the term "agent" means a computerized model of an actor. 4	This finding sounds trivial. In laboratory and field experiments persons' opinions are hard to measure, which is why the participants' opinions play only a minor role in the scientific discussion. 5	The SAM model focuses on task-oriented behaviour thus emotional leaders - or other kinds of leader - are not represented. BALES R F, COHEN St P (1979), Symlog. A Manual for Case Study of Groups. New York: Macmillan Publishing Co.
BECKER-BECK U (1997), Soziale Interaktion in Gruppen. Struktur- und Prozeßanalyse. Opladen: Westdeutscher Verlag. BOOS M (1996), Entscheidungsfindung in Gruppen. Eine Prozeßanalyse. Bern: Verlag Hans Huber. BRUNNER E J, TSCHACHER W (1991), Distanzregulierung und Gruppenstruktur beim Prozeß der Gruppenentwicklung. I.: Theoretische Grundlagen und methodische überlegungen. Zeitschrift für Sozialpsychologie, Vol. 22, No. 2. pp. 87-101. DEFFUANT G, NEAU D, AMBLARD F, WEISBUCH G (2000), Mixing beliefs among interacting agents. in: Ballot G, Weisbuch G, (eds. ), Applications of Simulation to Social Sciences. Oxford: Hermes. DÖRING N (1999), Sozialpsychologie des Internets. Die Bedeutung des Internets für Kommunikationsprozesse, Identitäten, soziale Beziehungen und Gruppen. Göttingen: Hogrefe. FREY S, BENTE G, FRENZ H-G (1995), Analyse von Interaktionen. In Schuler H (Eds. ), Organisationspsychologie, 2nd edition. Bern et al. : Verlag Hans Huber. GILBERT N, TROITZSCH K G (1999), Simulation for the Social Scientist. Buckingham et al. : Open University Press. GIRGENSOHN-MARCHAND B (1994), Ergebnisse der empirischen Kleingruppenforschung. In Schäfers B (Eds. ), Einführung in die Gruppensoziologie. Heidelberg: Quelle & Meyer. HEIL A H (1997), Inhouse-Kommunikation über Electronic-Mail in einem Führungskräfteteam - Eine qualitative und quantitative Untersuchung. PhD thesis, University of Dortmund. HERRMANN Th (1995), Workflow Management Systems: Ensuring Organizational Flexibility by Possibilities of Adaptation and Negotiation. In ACM Conference on Organizational Computing Systems (COOCS) '95. Proceedings. New York: ACM Press. HERRMANN Th, STAHL G (1998), Verschränkung der Perspektiven durch Aushandlung. In Sommer M, Remmele W, Klöckner K: Interaktion im Web, innovative Kommunikationsformen. Stuttgart: Teubner. HERRMANN Th, STAHL G (1999), Intertwining Perspectives and Negotation. In Proceedings of the International ACM SIGGROUP Conference on Supporting Group Work. New York: ACM Press. JANIS I L, MANN L (1977), Decision Making. A Psychological Analysis of Conflict, Choice, and Committment. New York: The Free Press. KERRES M, ROSEMANN B (1992), Partizipationspotential und partizipatives Handeln bei Einführung neuer Technologien. Zeitschrift für Personalforschung, Vol. 6, No. 1. pp. 5-17. KIRK J, COLEMAN J (1967), Formalisierung und Simulation von Interaktionen in einer Drei-Personen-Gruppe. In Mayntz R (Eds. ), Formalisierte Modelle in der Soziologie. Neuwied et al. : Luchterhand. LATANÉ B (1996), Dynamic Social Impact. In: Hegselmann R; Mueller U; Troitzsch KG (Eds. ), Modelling and Simulation in the Social Sciences from the Philosophy of Science Point of View. Berlin: Springer, pp. 285-308. LEPPERHOFF N (2001), Multi-agent systems and their reverse function: a first approach. In Urban Ch (Eds. ), 2nd Workshop on Agent-Based Simulation. Ghent: SCS-Europe BVBA. LEPPERHOFF N (2002), SAM - Untersuchung von Aushandlungen in Gruppen mittels Agentensimulation. Jülich: Forschungszentrum Jülich GmbH. LESSEL E (1985), Soziale Interdependenz. Computergestützte Theorieentwicklung für experimentelle Entscheidungssituationen. Frankfurt / Main: Peter Lang. LINDSTÄEDT H (1998), Qualität von Gruppenentscheidungen. OR Spektrum, No. 20. pp. 165-177. MANZ Th (1990), Akteurspezifische Voraussetzung in Betrieblichen Innovationsprozessen. In Kißler L (Eds. ), Partizipation und Kompetenz. Opladen: Westdeutscher Verlag. MCGRATH J E (1984), Groups: Interaction and performance. Englewood Cliffs: Prentice-Hall. MCGRATH J E (1993), Time, Interaction, and Performance (TIP) - A Theory of Groups. In Baecker R M (Eds. ), Readings in Groupware and Computer-Supported Cooperative Work Assisting Human-Human Collaboration. San Francisco: Morgan Kauffmann. NOWAK A; LEWENSTEIN M (1996), Modelling social change with cellular automata. In: Hegselmann R; Mueller U; Troitzsch KG (Eds. ), Modelling and Simulation in the Social Sciences from the Philosophy of Science Point of View. Berlin: Springer, pp. 249-285. ORTMANN R G (1995), Mikropolitische Prozesse in der Büroorganisation. In Eichener V, Mai M, Klein B (Eds. ), Leitbilder der Büro- und Verwaltungsorganisation. Wiesbaden: Deutscher Universitätsverlag. OSTMANN A (1992), On the relationship between formal conflict structure and the social field. Small Group Research, Vol. 23, No. 1. pp. 26-48. PELZ J (1995), Gruppenarbeit via Computer: Sozialspychologische Aspekte eines Vergleichs zwischen direkter Kommunikation und Computerconferenz. Frankfurt /M. et al. : Peter Lang GmbH. SADER M (1996), Psychologie der Gruppe. Weinheim: Juventa. SCHNEIDER H-D (1985), Kleingruppenforschung. Stuttgart: Teubner. SEBENIUS J K (1992), Negotiation Analysis: A Characterization and Review. Management Science, Vol. 38, No. 1, pp 18-38. SIMMEL G (1958, first 1908), Soziologie: Untersuchungen über die Formen der Vergesellschaftung, 4th Edition. Berlin. TROITZSCH K G (1996), Individuelle Einstellung und kollektives Verhalten. In Küppers G (Eds. ), Chaos und Ordnung. Formen der Selbstorganisation in Natur und Gesellschaft. Stuttgart: Reclam. TROITZSCH K G (1997), Social Sciences Simulation - Origins, Prospects, Purposes. In Conte R, Hegselmann R, Terna P (Eds. ), Simulating Social Phenomena. Berlin et al. : Springer. ZANDER A (1979), The Psychology of Group Process. Annual Review of Psychology, Vol. 30. pp. 417-451.